Take a Walk on the Bright Side recalls a simpler time when family was everything. 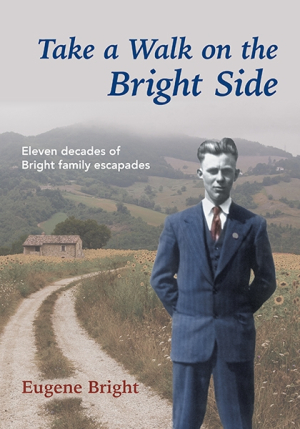 Eugene Bright’s memoir, Take a Walk on the Bright Side, gives a detailed history of more than a century of the Bright family, detailing their frequent moves and the work ethic that helps them survive tough times. This family history begins with Bright’s grandparents’ years in Canada and Montana in the late 1800s, offering newsworthy events of the time period at the beginning of each chapter. Research, along with occasional suppositions about how events may have occurred, fleshes out the family stories. Accounts of farming practices and rural life add appeal. Bright’s family members epitomized the hardworking, “sod-busting” farmer of the late nineteenth century. Traces of the rest of his family result in glimpses into his Grandpa Tom’s multiple marriages and struggles to provide for his family as he moved them west, to Saskatchewan and then Montana. All in all, the trials and tribulations of more than one hundred years of Brights are detailed. The family tree is displayed prominently at the beginning of the book, and it is easy to refer to when names and relationships become foggy. Extensive endnotes help to explain some details, also serving as a bibliography. Bright mentions that he relied a great deal on relatives, his own memories of his parents’ tales, and Internet research, which together create a very complete family history. A map of the family homestead is included, too, adding substance and further detail to family memories. Details are sometimes too plentiful, such as the indication that a dishwasher was installed in their house in 1976 to “ease the housework burden.” It sometimes seems like a book that should be handed out at a family reunion because of the specificity to the clan. Those not in the family circle may not see the value in all of the very specific events. Bright’s way with words also makes his family story an entertaining one. Grandpa Tom is shown to be a true character—a man who had at least five wives—and stories that include him are appealing. Interspersed are family photos, adding faces to the stories. Take a Walk on the Bright Side recalls a simpler time when family was everything. The Bright family is entertaining on occasion, but there is no high drama. It’s a quiet tale of one family’s roots told in a very reader-friendly style.